The Erawan Shrine stands majestically in glittering gold at the busy junction of Ploenchit and Rajadamri Roads in the heart of downtown Bangkok. Every day, thousands of devotees both Thai and foreigners pray at the shrine to seek blessings, fulfillment of dreams, success in personal lives and careers. What was the origin of the legend? Many Thais believe that there's a deity or god residing in every plot of land. Before construction of any structure on the land, a ceremony must be held on an auspicious date to lay the foundation so as to appease the deity. When the project is completed a permanent shrine consisting of a spirit house, housing the chosen deity, is erected at an auspicious location on the plot of land. This accounts for the spirit houses in the gardens of many Thai houses. In 1953, work commenced to construct the Erawan Hotel some 50 metres behind the present location of the shrine. The required ceremony of appeasing the land deity was duly conducted. However, the project was dogged by delays and mishaps that spooked the rural Thai construction workers to the point of halting their work completely. The hapless contractor turned in desperation to the advice of a well-respected astrologer, who discovered that the foundation stone of the building was not laid on an auspicious date. To reverse the tide of misfortune, a shrine had to be constructed to honour the god Brahma. The shrine was inaugurated at the junction on 9 November 1956, a date carefully chosen this time. Many foreign visitors refer to the deity as the four faced Buddha. This is a misnomer. Brahma was a four-faced Hindu god worshipped in Brahmanism, a religious system under orthodox Hinduism. The Thais call Brahma, Than Tao MahaProm or Phra Phrom. 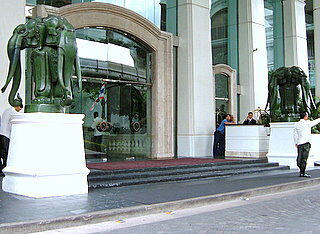 The shrine was named Erawan after Indra's legendary three-headed elephant. For more on the legend of Erawan, please see the Erawan Museum. To get there, please see map of the Erawan Shrine. The construction of the hotel proceeded without any further delays and the building was soon finished. Word of the power of the four faced Buddha spread far and wide and the legend of the Erawan Shrine was born. Thais and foreigners, particularly tourists from SE Asia, Taiwan and Hong Kong flocked to the shrine to seek the blessings of Brahma. 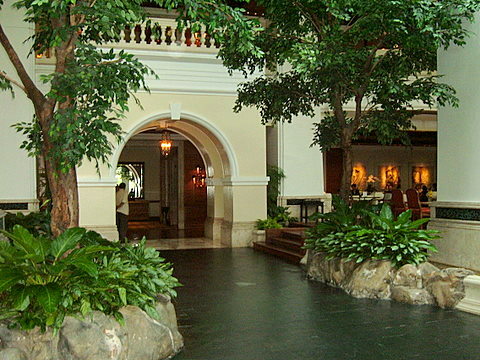 When the international 5 star Hyatt hotel chain took over the original Erawan Hotel and rebuilt it, the Hyatt management wisely retained the Erawan Shrine and adopted the name Grand Hyatt Erawan Hotel. It doesn't pay to tamper with matters that can't be completely explained by the laws of logic. In November 2004, a new boutique shopping mall opened behind the Erawan Shrine and yes, it's adopted the name Erawan Bangkok like its neighbor. On the morning of 21 March 2006, tragedy struck. A mentally ill man smashed and shattered the revered image of Brahma at the Erawan Shrine. He was beaten to death on the spot by two workers who have been charged for the offence. The brutal killing of a mentally ill man for grossly vandalizing a revered Hindu deity in a predominantly Buddhist society is a cause for some soul searching. The Department of Fine Arts is replacing the original gold plated plaster statue with a metal one made of an alloy, "nawa loha", consisting of nine metals including gold and silver. The new statue is expected to be ready in two months time. Meanwhile the shrine has reopened for worshippers on 23 March. The smashed image, however, is covered with a white cloth. The cost of the new statue is estimated at 20 m baht or almost US$ 0.5 m. The Than Tao Mahaprom Foundation that is responsible for the shrine welcomes donations from devotees. Donations can also be in the form of any metal. In spite of this setback, the Erawan Shrine retains its aura to this day and remains a Bangkok legacy that pulls thousands of faithful worshippers, many of whom are waiting for the new statue to be ready. In May 2006, the Department of Fine Arts announced that the new statue for the shrine is ready. The ceremony for the installation of the new deity will be held later in May. We can be certain that an auspicious date will be chosen. 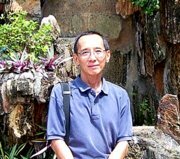 Devotees from Hong Kong have chartered a plane to Bangkok to attend the consecration ceremony, such is the strength of the following. 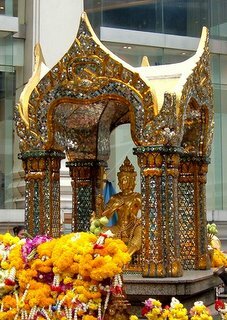 On 21 May 2006, the re-installation of the new statue of Brahma took place in a grand enshrining ceremony, telecast live, at the Erawan Shrine. The new statue underwent a series of rites in an elaborate ceremony that started precisely at the auspicious time of 7.29 am on Sunday 21 May 2006, when the statue departed from the Fine Arts Department. The next stage was a blessing ceremony at the City Pillar Shrine near Sanam Luang, then a holy water rinsing rite at the Temple of the Emerald Buddha. This was followed by a Brahmin ceremony at the Brahmin Temple in Kalayana Maitree Road. 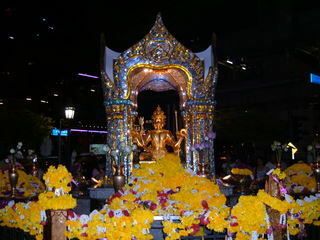 The statue arrived at the Erawan Shrine for the installation ceremony at 11 am on the dot. The participants walked three times around the shrine by 11.39 am and the entire ceremony was completed at 11.59 am. Brahma has finally returned to his rightful place. The crowds that gathered around the Erawan Shrine on the evening of 17 August 2015 were the usual worshippers with curious onlookers and shoppers milling around outside and on the skywalk overhead. At about 1900 hours a loud explosion was heard followed by a large ball of flames which took some time to burn out. One of those nearby said the ground shook as if it were an earthquake. It wasn’t, it was a bomb! The bomb was placed within the fenced enclosure of the shrine. The effects were devastating; mangled bodies and parts, twisted wrecks of motorcycles. Surprisingly the statue of Brahma suffered minimal damage, a chip off the chin and in one of the hands. In the aftermath, the casualty toll was 20 dead and 125 injured as at early morning 19 August 2015. Details of those responsible for this atrocity are still unknown. 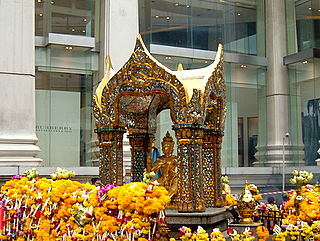 The Erawan Shrine has seen so much political turmoil and bloodshed in recent years. This tragedy adds to the misfortune plaguing this famous junction. Is the shrine that’s supposed to deflect bad luck drawing it in instead?